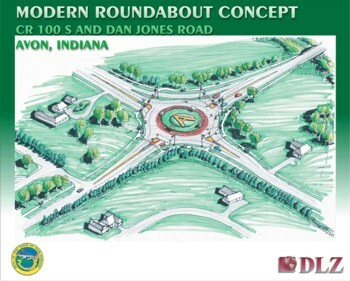 Ground has broken on the new roundabout at County Road 100N and Dan Jones in Avon, giving the city it’s third roundabout. Now, we have the rules. Nothing is ever as simple as it seems; you merge into the roundabout and get off at the appropriate turn, Right? Maybe! Recently codified rules of the roundabouts were adopted by the Town of Avon and improper use can result in a $170.00 ticket. Approach – when approaching the roundabout, you must yield to both lanes of traffic – of course this means you may never make it into the roundabout. Exiting – Turn on your right turn signal – no left turns allowed Roundabout only runs counter-clockwise – you can turn left, you just can’t exit left Once inside the roundabout, you must stay in the same lane until you exit – make sure you enter the roundabout in the correct lane. Except - If you enter in the outside lane, you must exit at the first or second right. If you enter in the inside lane you may not exit the first or second right, you must go around the roundabout, then get in the outside lane. Vehicles in the outside lane can not overtake vehicles in the inside lane and must give them room to exit – To me, this sounds like a mini 500 race with everyone going in circles, not sure if they can exit or change lanes. I think everyone does just fine without having to wonder if they entered in the right lane so they can exit at the appropriate time without taking home a ticket. Makes you want to find routes around the roundabouts. These are nationally accepted roundabout rules, so I assume the same rules apply to roundabouts in Carmel as well. I once read a lengthy report about roundabouts after an in-depth study was done. I beleive it was done by a dutch company. I can't find it anymore but it basically said that roundabouts are much more efficient than regular intersections. I tend to agree. I Wish we had more of them. You forgot to mention anything about pedestrians. On the approach to the entrance to the round-a-bout is generally a pedestrian crosswalk. I'll bet no one knows this because no one is looking or paying attention. The pedestrian generally has a median to cross to and then he can finish the other side of the street. But this is not always the case. Many times there aren't any sidewalks but there may be crosswalks anyway. Thanks for adding the pedestrian details. I actually found my info from a newspaper article when the round-a-bout was opening at 100S and Dan Jones in Avon. There wasn't a mention of pedestrians in the round-a-bout rules. Now that I think about it, I don't believe there is a crosswalk at many of the round-a-bouts, which makes it an extremely dangerous place for pedestrians to cross.